Marcin Floryan » Jurgen’s keynote at ACE! You can now watch the closing keynote that Jurgen Appelo gave at the Agile CE conference in Kraków. And you should, because Jurgen is a very good speaker and it was a great presentation with an important message. 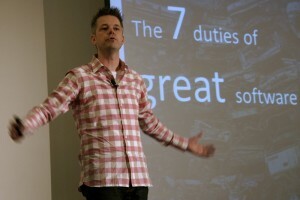 It talks about the seven duties of great software professional. What makes the talk even more interesting and relevant is that Jurgen weaves plenty of personal examples from how he approached writing his Management 3.0 book. As Jurgen was giving examples of setting (and achieving) his personal goals (00:27:00), as he was demonstrating ways to organise himself (like validating every new blog post against a detailed check list 00:29:00) and when he showed how he measured his own progress (00:35:00) I was very keen to watch the audience. The reactions were mixed. From what I could gather from people’s facial expressions and body language, sighs, gasps and phews they were impressed, surprised, shocked, bewildered, amazed, amused, bewildered, horrified, … and in most cases I couldn’t resist the impression that the experiences described by Jurgen where alien to, at least, some of us. I felt as if the level of personal commitment, the self-discipline, the measurements, etc… were somehow reserved for the “great” people like Jurgen. I don’t think that’s the case. Yes, Jurgen, no doubt, is intelligent, focused, hard working and he is successful because he chose to. We all have the same choice and Jurgen is even giving us the tools and the techniques to follow up. We can pick them, apply to our personal goals and become as successful. It will not be easy, it may require 15 years of failure but if we persevere we will achieve. Even if we don’t choose to write another great book or become a keynote speaker we have an obligation, as great software developers, to improve ourselves and our work. I hope most of you have already started. Awesome summary of a great talk. I especially like the reference to the tools, and that we all have a choice to make a difference.